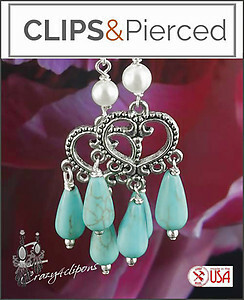 Features: These Chandelier clip on earrings offer charming style. Pretty blue/green Magnesite teardrops dangle of a vintage-like heart charm and topped with a simulated pearl, making these clip earring design a fabulous find. Add a versatile splash of color to your casual wardrobe with these chandelier earrings. Available for pierced and non-pierced ears. 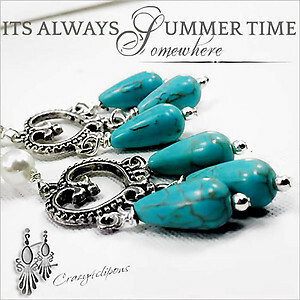 Specs: Magnesite blue/green teardrops, antiqued silver charms and silver plated metals.